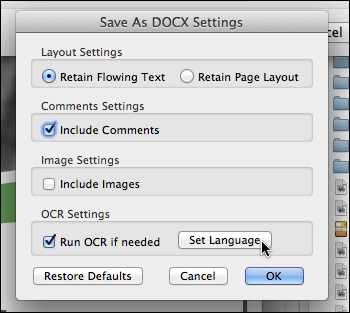 This is what I get when I ask Adobe Acrobat Pro to save a large PDF file as a Word document, using OCR to extract the text if needed. And it goes on for several minutes. First of all, what’s the point of having a progress bar if it’s not indicating progress? Clearly in this case, instead of giving visual feedback about the length of the entire process of saving the PDF file as a Word document, I get visual feedback about hundreds of individual subprocesses that I don’t give a flying hoot about. And the result is that I have absolutely no idea of how long the entire process will take. It could be 30 seconds. It could be 2 hours. There is no way to tell. And then, even at the individual-process level, there is the fact that, if you watch carefully, you will see that sometimes the progress bar actually moves backwards. In other words, Acrobat is not even able to give a useful estimate of the time each individual process will take. But instead of doing what all other progress bars in the known universe do, which is to adjust their speed to reflect the adjustment in the time estimate, Acrobat makes the progress bar move back in the other direction, making it an even less useful indication of how long the individual process will take. It’s absolutely ridiculous. My interpretation here is that Acrobat will use normal text extraction techniques whenever possible, and only OCR on pictures of text if all else fails. Yet clearly that is not what the option does here. Of course, each PDF is different, and maybe there is something in this particular one that makes Acrobat think that it has to run OCR on every single page — although I fail to see what it could be, since most pages simply consist of text in the main area with a running footer, and I am able to select all textual elements in those pages using the text selection tools in Acrobat, i.e. without OCR. The bottom line here is obviously that Adobe Acrobat Pro is a piece of crap — a very expensive one, mind you. I still use it when I don’t have much of a choice, but it really is quite shocking. I tried to use it a few weeks ago to create a fillable PDF form, and its tools for this nearly drove me insane. I ended up switching to PDFpenPro, which I had got as part of a bundle a few weeks beforehand. Its interface isn’t perfect either, but at least it’s reasonably Mac-like, and it’s pretty much usable, albeit with a little help from the on-screen manual. Adobe Acrobat Pro, on the other hand, is in most cases just a nightmare to use. This entry was posted by Pierre Igot on Monday, June 4th, 2012 at 7:40 am	and is filed under Macintosh. You can follow any responses to this entry through the RSS 2.0 feed. Responses are currently closed, but you can trackback from your own site.